Two night minimum stay for all campsites on holiday weekends Canadian and American Holiday June 30 - July 2; Civic Holiday August 4 - 6; Labour Day September 1 - 3. Three night minimum stay for all rental units on holiday weekends Canadian and American Holdiay June 30 - July 2; Civic Holiday August 4 - 6; Labour Day September 1 - 3. 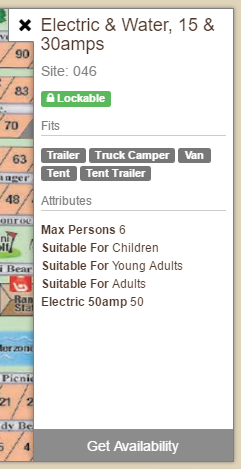 Pets are not allowed on your site if you are camping in one of our rental trailers, cottages, deluxe cabins, bare bones shelters or if you are camping in the Rustic tenting area. In order to lock in your site number request there is a $20 fee. There are absolutely no refunds on the site locking fee - this includes cancellation of reservations, changing of dates, or dissatisfaction with the site you chose. 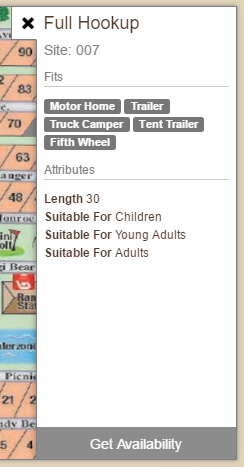 We do not lock in site requests for our Park Model Trailers, Cabins, Cottage or Lodge rentals.